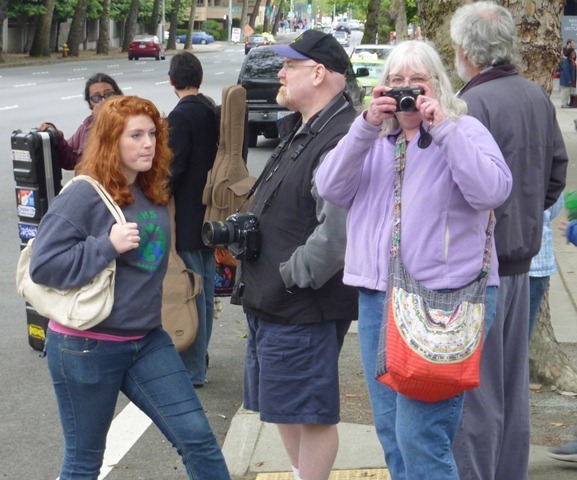 Last weekend, our Aunt Edie and Uncle Jim made it to Seattle on their Nationwide Tour Extravaganza (OK, I’m pretty sure they just call it a really long roadtrip, but that sounds so tedious so I thought I would jazz the name up for them a little bit!) We had the option of sitting on the couch staring at each other catching up, or heading out to see the sights of Seattle. Aunt Edie had a small, but very strange list of things she wanted to see (more on that tomorrow!) so we told her that we could do that as well a few other things. We also thought it would be fun to invite my parents to come along. It just so happened that KT was volunteering at the Folklife Festival, so that seemed to be a perfect place to start. It’s interesting to note that Aunt Edie and my father have the exact same fashion sense…socks and sandals. 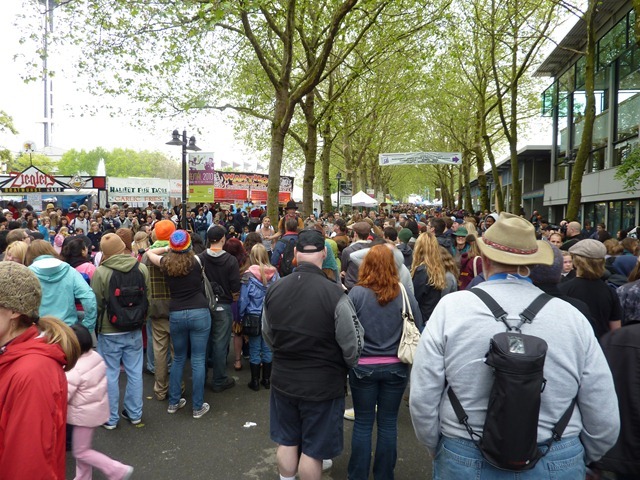 Despite the fact that Folklife has been around for nearly 30 years, this is the first one that I have been to. As far as I can figure out, it’s mainly a celebration of life. The rainy weather didn’t seem to have much effect on the crowds. We had been watching some street performers when Mom decided that they needed a little encouragement. She grabbed a dollar bill and ran out to tip them. I fear that the actor thought she wanted to tuck it in a…well…let’s say secure spot…but she said she wanted to give it to them before the rush started. Mom’s never been the shy one and really enjoyed being made a small part of the show. After all the excitement of Mom’s showbiz debut, everyone came out of hiding for something to eat. 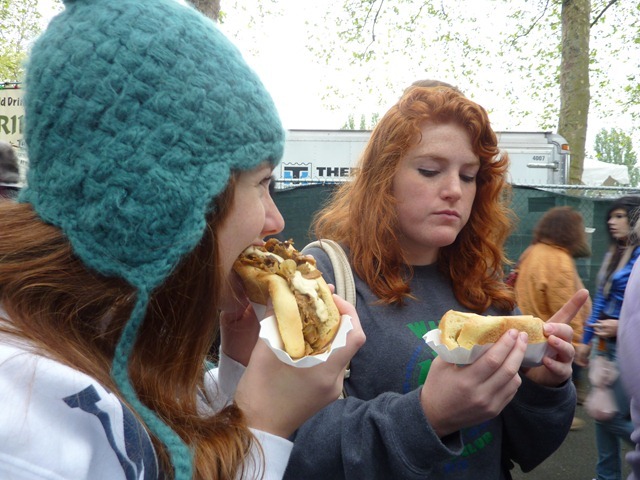 KT and Mimi chose a yummy vegan cheesesteak and veggie dog. I settled for kettlecorn. 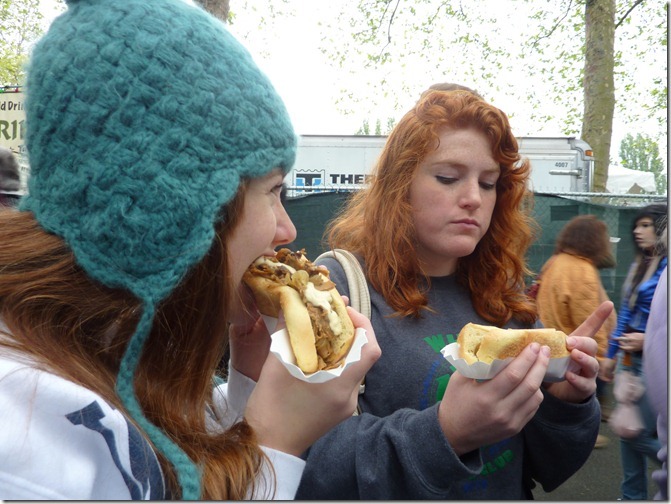 We left KT to her volunteer duties and headed over to Pike’s Place Market…a true tourist Mecca. Don’t you think this bunch looks like a small herd of tourists? 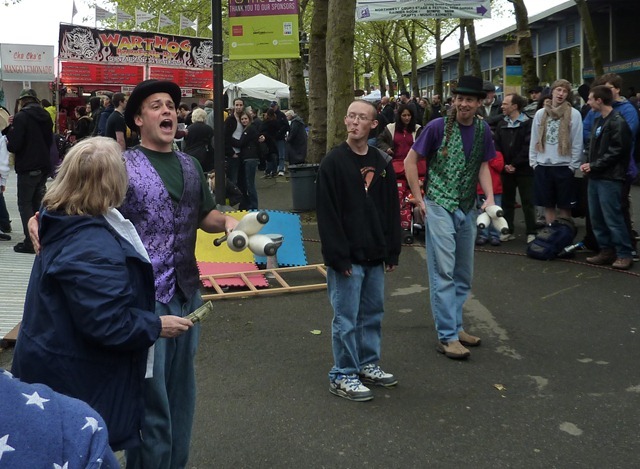 This entry was posted in Adventures, Family, It's all Relative, NaBloPoMo, vegan and tagged out of town guests, relatives, Seattle, Seattle Center, Seattle Folklife Festival, street performers, tourists. Bookmark the permalink. Great pictures, remember this fair well. Lots of fun and now new friends. I really like your Aunt Edie, and Uncle Jim also. Looks like a fine time was had by all!!! I just love festivals!! We’re all aloeing up tonight after a tournament weekend spent in the 90 degree sun. I’m thinking 90 degrees is a bit too much. I have a narrow comfort zone! look tiny. We’re in Green River, Wyoming tonight. 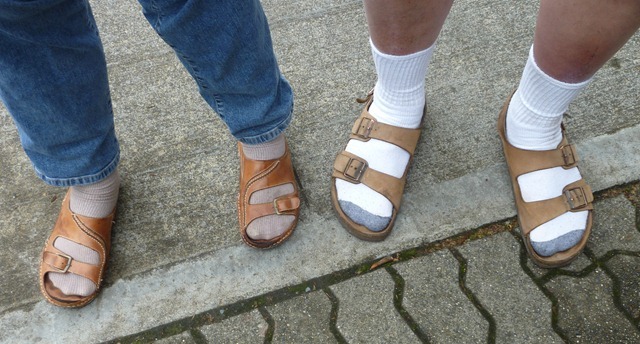 Poor Dad has to special order his shoes. I can put my entire shoed foot inside of his. It kinda makes me feel like a little kid! I think they look like a lovely herd of tourists! What a great time everyone seems to be having. Nationwide Tour Extravaganza does sound much better! Sounds like an event I’d love to visit.